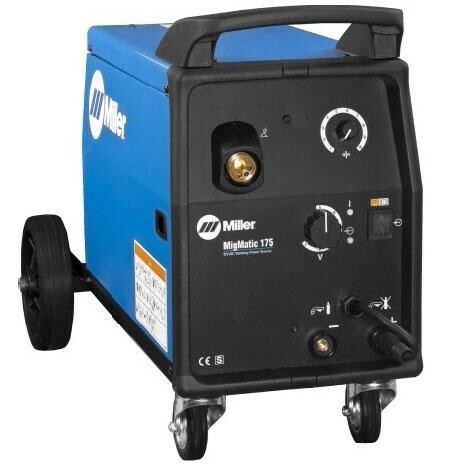 The Miller MigMatic 175 is a traditional tapped design Mig welder. Running off single phase 230v the traditional rectifier based power source benefits from a full 3 year Miller True Blue Warranty. Rated at 150 A at 35% Duty cycle, the MigMatic includes a built in undercarriage with a bottle rack for easy manoeuvrability of the power source and ancillaries. Quick and easy installation of professional style torches, allows the operator to have a separate torch for other applications. Robust motor & drive assembly with wire speeds ranging from 1.8-18m/min. With dual grooves allows one set of drive roll for two wire sizes. Permits the use of larger more economical reels of MIG wire without the need for additional spool adapters.